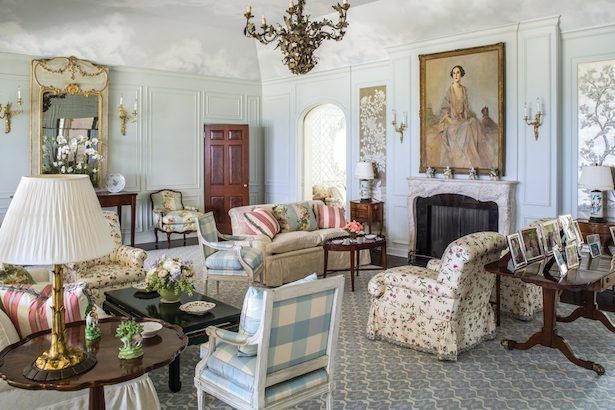 Gingham and chintz harmonize in this traditional living room for a bright and airy space that is full of Chinoiserie details and Southern charm. I can hardly believe that we moved into our house in TN 2 years ago! Renovations have been slow and steady with little transformations happening all over the house. I am learning to accept that the decorating progress should be organic as we have time and energy (plus $$$) to make these changes. This way we are confident in the renovations we do and truly appreciate the new updates. Our formal living room has been freshened up since we moved in. Gone is the buttercream yellow, the wallpaper boarder, and the vanilla and burgundy cornices. We painted the walls basalt powder from Lowe’s Sherwin Williams collection, cleaned the sconces and fireplace, and redid the cornices. I have acquired many of the centerpieces for the new decor in this space, but I’ve only had a vague vision of what I wanted, so I thought it was finally time to solidify the design for our living room. 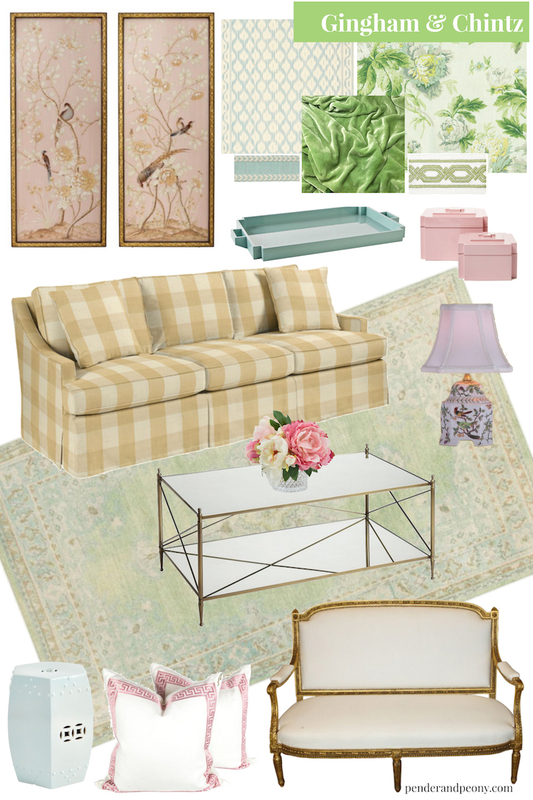 I’m calling the traditional look a gingham and chintz romance. 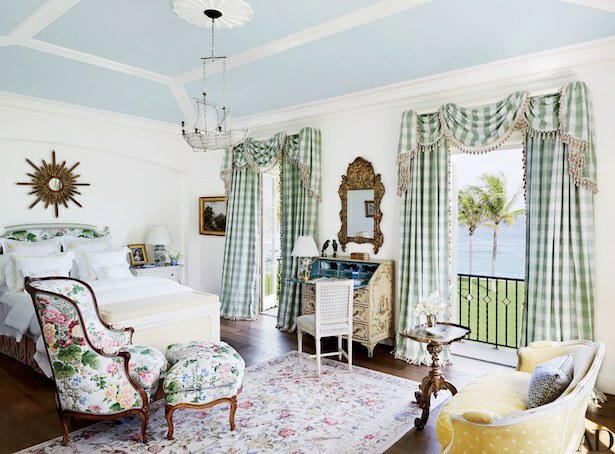 These are the two main patterns that will predominate in the space, and I love how the cheerful chintz plays off the chic gingham for a classic look that is formal yet also fanciful and crisp. We use our living room quite frequently, choosing to sit in there and sip coffee on the weekends, enjoy a bottle of wine and relax in the evenings, and of course entertain in this space after dinners and at holidays. 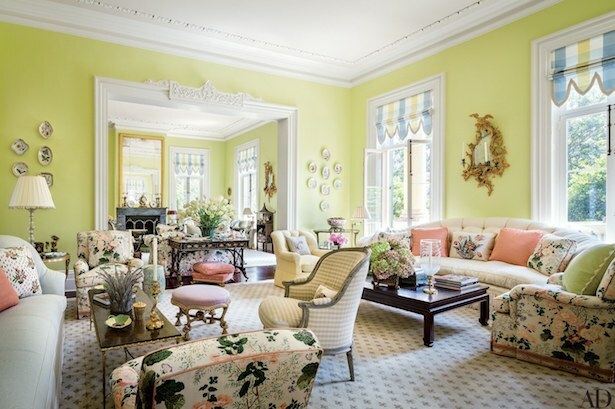 I want this space to feel welcoming, cheerful, feminine, and just a little fanciful. 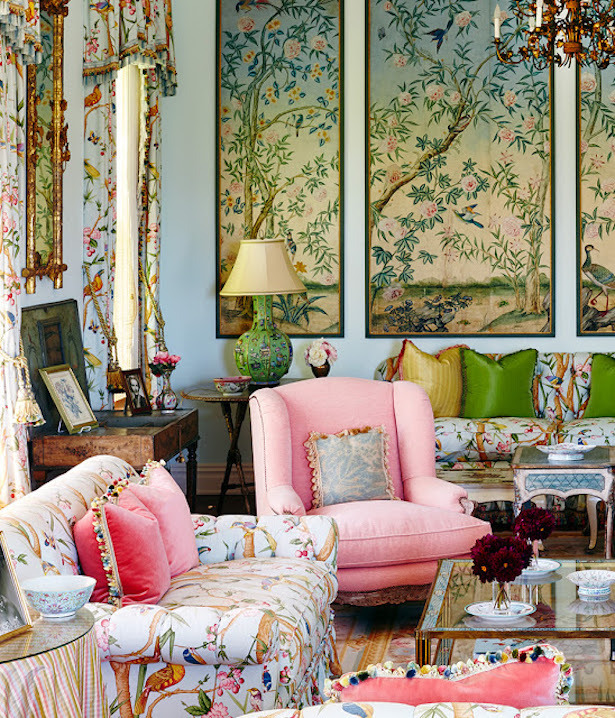 Chinoiserie details, a bright color scheme, classic furniture, and pretty florals mixed with the gingham and chintz create this traditional look. Right now the living room looks a bit like a hodge podge with so much mismatched furniture and bits and bobs undone. But acquiring the foundational elements for this room is a big deal. 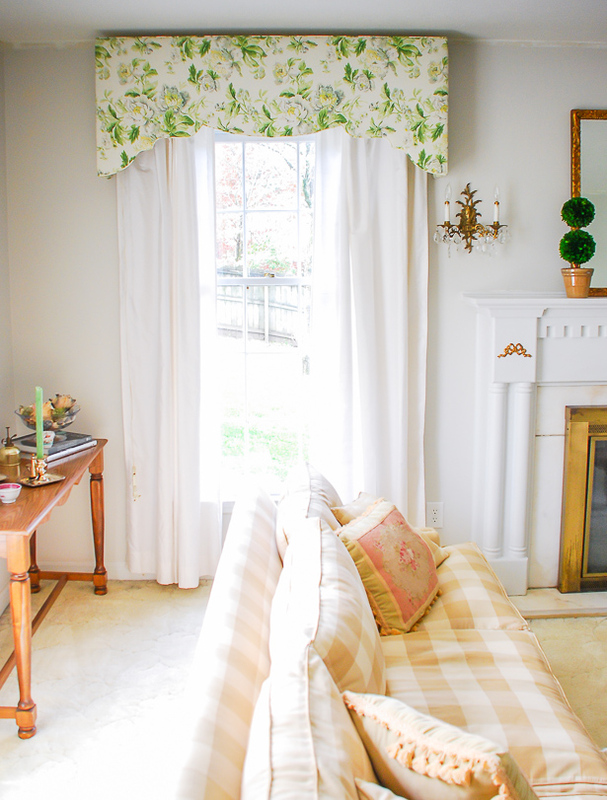 I found the gingham sofa at an estate sale for a whopping $150! It needs a little TLC with some new stuffing, and we are talking about adding height with some new legs. 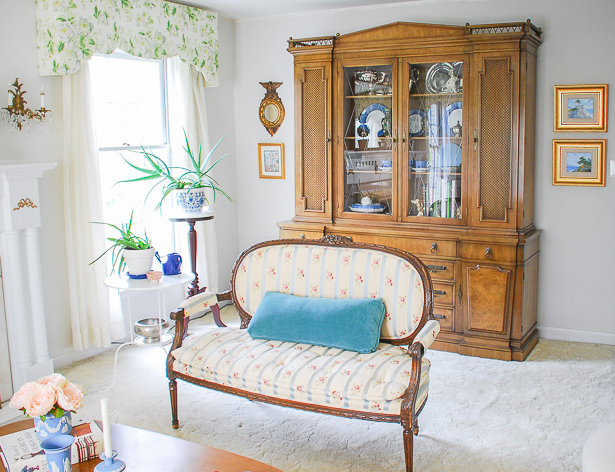 The French settee and the bookcase came from an auction house in S.C. that always has awesome home furnishings. I plan on recovering the settee in a green velvet for a bold punch. 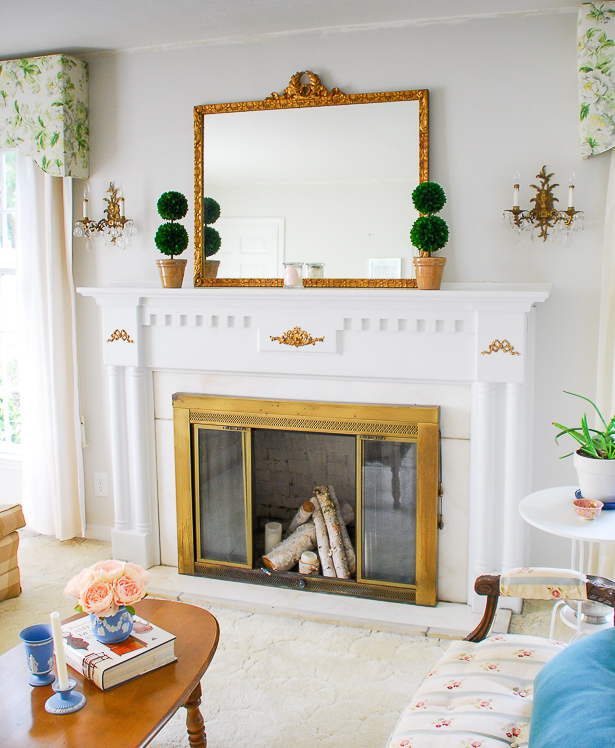 The other centerpiece of the room is the stately gilt mirror atop the mantel. It was hidden away at this little antique store here in Clinton, and I fell in love with the laurel wreath crest and bell flower details down the sides. I decided early on to keep the cornice boards to re-use, so when we took them down I ripped off all the old fabric and padding. It took a while to find a fabric I wanted to use over the windows. I knew a bold multi-colored print was key, but finding the right one that wasn’t too busy with a good palette was trying. Finally, my mom dragged me to Foam and Fabric in Asheville where after an hour of walking the rolls of bolts and comparing chintz versus toile versus damasks we happily settled on this sprawling floral by Waverly called Fleuretta Spring. Then away the cornices went to the upholsterer to be cut down and re-covered! And of course the other 2 significant renovations still in the works are hard wood floors and crown molding. We plan on doing a dark textured wood throughout the entire first floor. For more of my inspirations check out my 515 Vista Drive board on Pinterest! What decorating projects are you tackling? Your living room has turned out into a lovely place. Adorable! 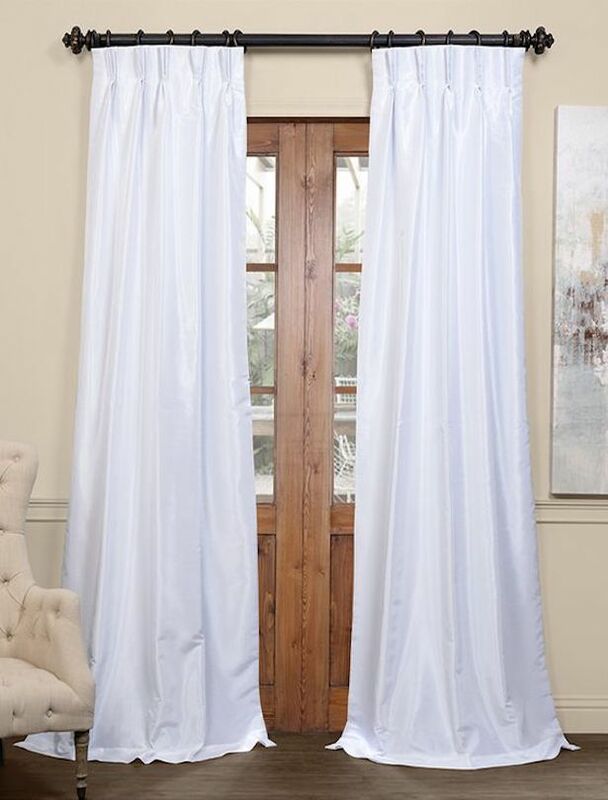 I particularly loved those white long curtains. Thanks so much Stella! I’m having fun decorating it!